Plymouth, Massachusetts was the sight of the second English settlement in North America. English colonists founded many of the early towns during the 1620s and 1630s. It was in the 18th century that the port city of Boston became known as the “Cradle of Liberty” for the agitation there that led to the American Revolutionary War of the 1770s. The early colonists were dependent on fishing, agriculture and trade with Europe. With the Industrial Revolution of the early 1800s, Massachusetts was transformed into a major manufacturing center. Before the colonists were Native Indians, including the Nipmuc, Pocumtuc, Wampanoag and Massachuset, who were dependent on hunting, gathering and fishing for most of their food supply. Between smallpox, measles and influenza, many of the Indian tribes of Massachusetts disappeared. During the 20th century, those surviving tribes developed state-recognized reservations. The Pilgrims of Plymouth settled in 1602. It was then the English Puritans who established the Massachusetts Bay Colony by 1630. While trying to survive the wilderness these new colonists also fought several wars between Native Indians in the 17th century. Into the 1700s a rebellious spirit developed with the people of Massachusetts. This led the other colonies to join together to fight for independence from England. 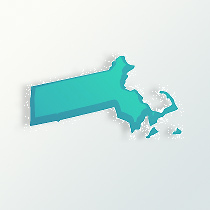 In 1795, Massachusetts was 95 percent of English heritage with a total population of 378,000 people. An important element in Massachusetts genealogy was due to the potato famine in Ireland. This is when the Irish immigrated to Massachusetts in huge numbers in the 1840s. Many French-Canadians came south into Massachusetts due to the increase in manufacturing jobs available in the expanding factories. By 1840 the population had grown to 737,700 people. After the American Civil War, many African-American from the southern states came to Massachusetts also for the industrial jobs and laborers. Other immigrants followed in the mid-to-late 1800s from Italy, Portugal and Poland. In 1900 the state population sat at 2.8 million. In examining Massachusetts genealogy, during the late 20th century, most of the immigrates arriving in Massachusetts have been from Asian (Chinese, Vietnamese and Cambodians) and Latin American nations. Of especially high numbers are those from Haiti. Most citizens of the state are white of European backgrounds; English, Irish, Italian, Portuguese and German. The African-American population represents 6 percent and the Hispanics 8 percent. The state’s total population in 2009 is about 6.6 million with 44 percent being Roman Catholics.